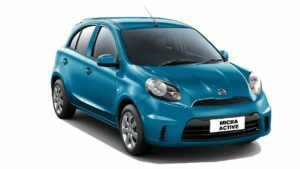 The Nissan Micra Active exterior remains unchanged on the styling front, except for the new integrated indicators on the door mirrors. Rest of the features on the new Micra, like the auto headlamps, rain-sensing wipers, etc., have been carried over from the preceding model. Retaining the same silhouette, Nissan has skimmed few design elements from the Active version such as the chrome accents and fog-lamps. Bumper in front is wider and rear section gets an ‘Active’ badge. Interior styling is similar to the pre-facelift version of Micra armed with basic features found in other hatchbacks in the segment. Akin to the exterior, the cabin too does not get any styling update; however, Nissan Micra Active interiors continue to feature auto climate control, steering-mounted controls, etc. The top-spec XV trim gets a new 6.2-inch touchscreen infotainment system supported by MirrorLink, whereas Apple CarPlay and Android Auto are missing. The Nissan Micra Active specifications have been carried over from the preceding model. It uses the same 1.2-litre petrol engine that puts out maximum power of 76 bhp against top torque of 104 Nm. Diesel variants too get the same 1.5-litre oil burner, which emanates 63 bhp and 160 Nm peak torque. The conventional five-speed manual gearbox is standard along and it gets an optional CVT.